Take care, Republican strategists. If you mount an exclusively anti-Hillary campaign, the Democrats will hit back in kind, and the Donald is a ripe target. Opening night of the Republican Reality Show, a.k.a. National Convention, unveiled a parade of pain. In the annals of exploited pain, it resembled a Jerry Lewis MS telethon. 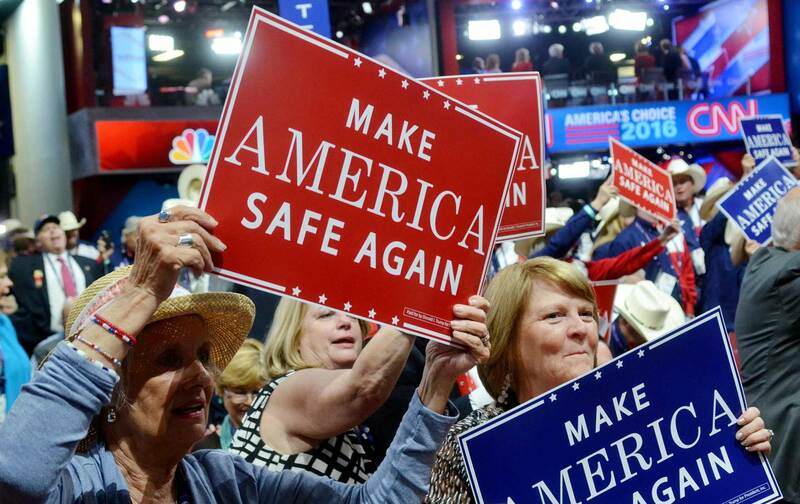 The grieving mothers, sad widows, and victims of murderous immigrants to whom the RNC granted five minutes of fame had two things in common: (1.) Their grief seemed genuine and affecting; and (2.) two people were blamed for it: Hillary Clinton and Barack Obama. Press-box epidemiologists also reported an outbreak of plagiarism, namely, in the inaugural address of presumptive first lady Melania Trump, who cribbed from—isn’t that a coincidence—the incumbent, Michelle Obama. More sympathetic observers explained sympathetically that in the wealthy circles where Mr. and Mrs. Trump move kleptomania is considered an entitlement program. Even New York’s former Il Duce Rudy Giuliani joined in the shaming. In a hard-hitting diatribe rife with historical fallacies and illogic he indicted a feckless Obama administration for its failures to act decisively, which was the cause of the things that were making America unsafe. Credit his former honor for boldly identifying the Menace That No One Dared Speak Its Name: Islamic Terrorism. There! I said it. Don’t you all feel safer? Mr. Giuliani implied that now that the problem is out in the open we could solve it, although he was too modest to give any specifics. Extrapolating from previous Republican administrations (including those of Bush père et fils), and from Donald Trump’s bluster, we can guess what the go-to answer will be: Invade some small country. The only question is, Which one? Don’t worry, President Trump will decide. Last night’s session reminded me of the two-minute hate sessions in George Orwell’s 1984 when people are mobilized to revile a scapegoat enemy du jour. Or how about Shirley Jackson’s famous story “The Lottery,” in which a town throws stones at the designated victim? And if we’re talking literary analogies, I also like Arthur Miller’s The Crucible, about the Salem witch trials. Here I want to pay special tribute to Chris Christie in the role of self-appointed prosecuting attorney. He led the audience through a call-and-response litany of Ms. Clinton’s sins (“Guilty!” “Guilty!”). Most prominent of these was that she caused all the foreign threats the United States now faces. Normally, Republican presidents find a foreign demon to wage war against, in defiance of John Quincy Adams’s sage advice that America “goes not abroad, in search of monsters to destroy.” But with Hillary declared chief villain, President Trump would logically have no one to justifiably wage a war of choice against. No doubt he’ll succeed in that task. Take care, Republican strategists. If you mount an exclusively anti-Hillary campaign, the Democrats will hit back in kind, and The Donald is a ripe target. The voting public will be revolted by the ensuing negativity, but most will agree that the man deserves it. And women, minorities, immigrants, and college-educated folk will vote for Clinton in even greater numbers.